The Spring Career Fair is an "All Majors" event. Employers considering this event should be attending with the intention of recruiting students for Full-Time positions, Internships and Co-ops. 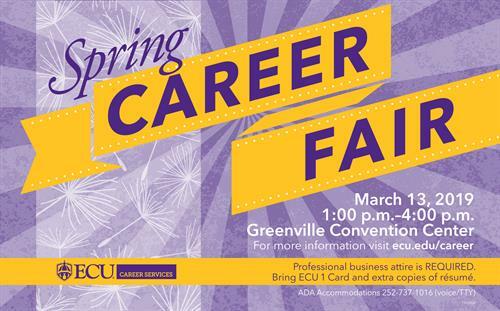 The Spring Career Fair will be held at the Greenville Convention Center, located at 303 Greenville Blvd SW, Greenville NC, 27834. The Spring Career Fair will be held on March 13th, 2019 from 1:00 PM - 4:00 PM. Regular Registration $495.00 : Includes one representative's attendance; buffet lunch, convenient parking, WiFi, 1 8ft table with cloth. Corporate Recognition Display $200.00: Employers have the opportunity to display their company logo and booth location on an individual slide projected on the overhead screen for the duration of the event. Additional Representative $30.00: There is a $30.00 fee for each additional representative added to your registration for this event.